Hotel distribution expert eRevMaxhas established 2-way connectivity with leading meta-search management solutions provider MyHotelShop. Mutual hotel customers can now update rate and availability to TripAdvisor, Trivago and Kayak to get more direct booking traffic through RateTiger and LIVE OS interface. MyHotelShopis a leading meta-search bid management solution provider in Europe currently serving around 1400 properties. This integration is another addition to eRevMax’s expanding partner ecosystem which provides hotels 360-degree solutions for distribution and revenue management. eRevMax provides seamless connectivity to all categories of third party booking sites (OTAs, Wholesalers, GDS, Tour Operators, Social Media, Metasearch sites) from a single platform. 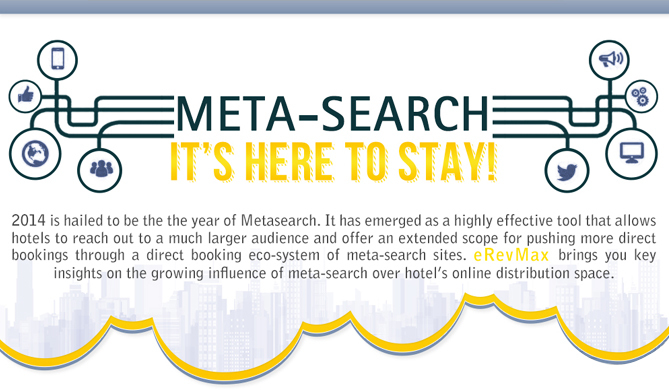 “Meta-search engines have become an important marketing channel for hotels. Following this integration, hotel customers can leverage the real-time rate and availability distribution across multiple meta-search sites. Due to the complexities of Bid Management process, a managed service for meta-search channels makes it easier for hotels from a digital marketing perspective based upon a monthly advertising budget,” said Ullrich Kastner, Managing Director & Founder, MyHotelShop. “This integration give our hotel clients a bid management solution for better positioning in meta-search channels and drive potential guests to brand website for more direct bookings. It is a highly effective tool that will allow our customers to reach out to a much larger audience and offer an extended scope for improving direct bookings through an eco-system of meta-search sites,” said Ashis Saha, SVP – Project Management, eRevMax. Previously, hoteliers have primarily focused upon direct marketing and OTAs, but there’s a new player in terms of hotel channel distribution and it looks like it’s here to stay. Meta search is proving hugely popular with the younger generation who, with perhaps tighter budgets than their older counterparts, are more cost conscious when it comes to travel. There has been a 13 percent increase in meta search traffic in the past year alone, with meta search websites such as Kayak processing almost 1600 million queries annually. It is widely suggested that hoteliers begin to amend their marketing strategies to include meta search in a more prominent role.